from across the country ... and the globe. Many thanks to all who have shared their comments and photos!!! "Lucy (left) loves her new bed so much! I am so amazed at the durability of this bed, considering how active and crazy Lucy can be, it is definitely well made! One of Lucy’s new favorite activities is jumping off the arm of the couch onto the bed, and then bouncing off ... kind of like a mini trampoline!" "... I have a puppy who had back surgery and sometimes has accidents at night, so I chose this bed for easy clean-up. All of my dogs wanted to curl up in it when I set it up. It looks great, seems very durable..."
"After seeing the blow up 'life saver' at first, I was very apprehensive ... But then we assembled the bed and put the soft cover on and Toby, our mininature poodle, (right) spent the entire day in it. I think we're sold! Thank you for a wonderful product and thought-through construction. 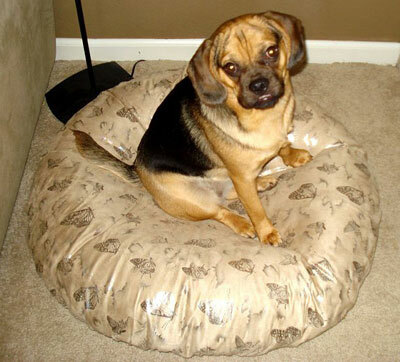 We bought it hoping it'll withstand the daily abuse as Toby thinks his beds are his toys and judging by the enormous zipper and thick sturdy material we think it will." [FOLLOW UP EMAIL] " ...I bought a bed from you a couple of months ago and just wanted to tell you again how genius these beds are! 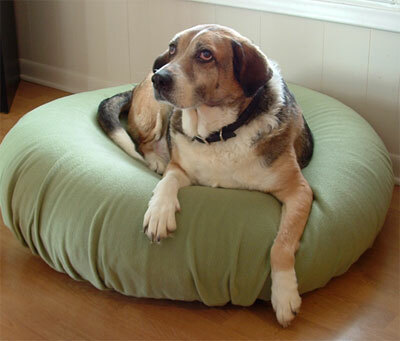 We used to come home daily to our dog's bed being thrown all over the place, with pieces of it all of over the floor. And the old beds didn't get used all that much to actually sleep in. Now, it's like night and day. 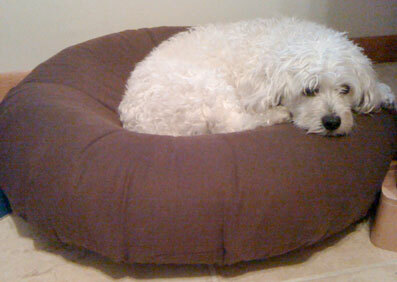 Our miniature poodle absolutely loves his new bed, always stays in it and never tries to eat it or play with it. It looks as new months later now. Great job on creating such a simple, but outstanding product!!" "Our cats (left) just LOVE these cozy beds. They fought over the first one we bought so we had to buy another! 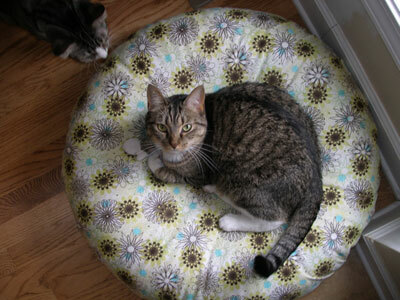 The beds are well made and very durable ... My cats definitely recommend these beds. "Great product and "above and beyond" customer service. Would recommend this bed to anyone. Absolutely flawless!" 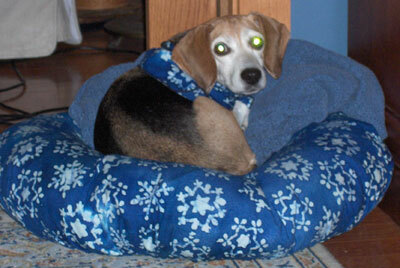 "Quality made product but best of all Farley, the beagle, loves it! :) SUPERIOR CUSTOMER SERVICE!!!" "Thank you thank you thank you! ... when I got home, "Venus Pearl", a Shepherd-American Bulldog mix, (right) was totally curled up and sleeping like a baby!! She snored so loud last night I had to wear earplugs." 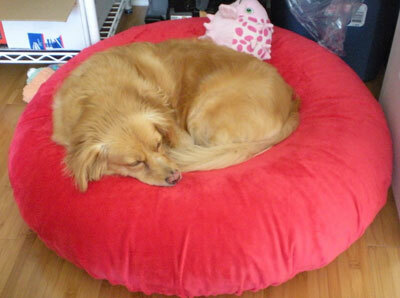 "Wonderful idea for a dog bed--our Beauty (left) loves it and so do we. Very well-made and great customer service!" "Such a quality product! ... because you inflate the bed yourself, you can make the bed 'harder' or 'softer' esp. as your pets get older and their joints get rickety... 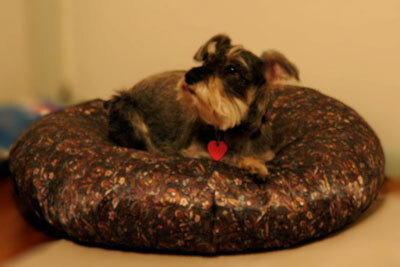 I really appreciate how (Gertie Gear) went to research fabrics just for me & Harley! 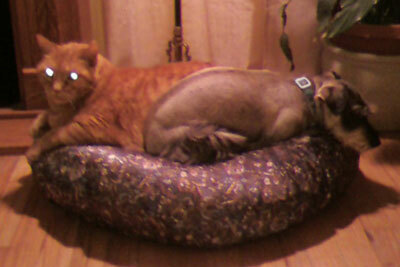 (right) ... she's already spent a few work days snoozing away on her new custom cover inflatable bed!" 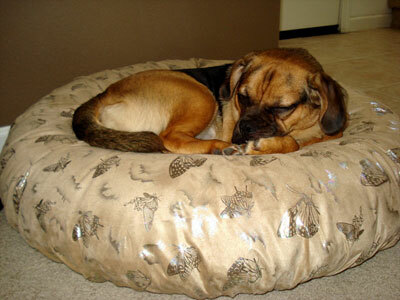 "Zoe (Chessie/Newfoundland mix) loves her new bed, she has not gotten off of it ... only to eat ... since yesterday. Thanks a bunch." 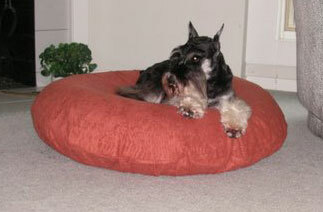 "Highly recommend ... (Gertie Gear) is a total gem to work with and (the) beds, covers and designs are awesome! Thanks so much for all your hard work, time and consideration with my order and for taking the time to chase up shipping to Australia:) "The Girls" just love them!" "'Chase' (Border Collie, agility champion) loves the new bed ... she sleeps on it every night." 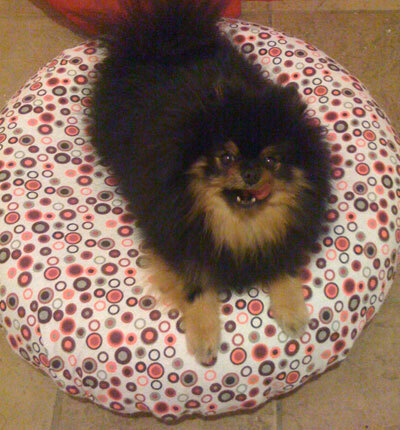 "My Pom LOVES his Gertie Gear bed! Perfect size and easy to maintain. I recommend this bed to everyone!" "Connor (right) loves the bed - Thank you again!" "'Layla' (greyhound) has been choosing to sleep in the back room on the (Gertie Gear) air bed over stayin in my office on the regular bed." 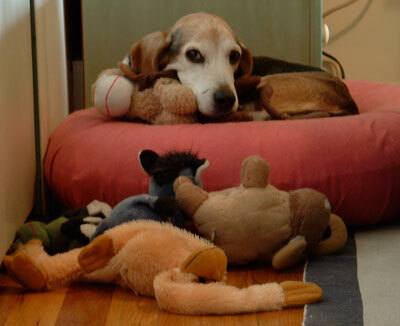 "I placed Brina’s 'Gertie Bed' where her other bed was in the front room …. ABOUT TWENTY MINUTES LATER I found my old girl right in the middle. SHE LOVES IT! Loves it! ... I was a little worried she wouldn’t get on it as its about her height ... but, she got right on ... I had planned on placing her in it, like you suggested. I was hoping she would locate it herself so that she knew where it was, and that it was for her. 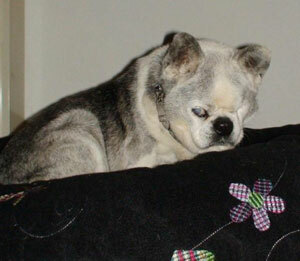 Her old blind and deaf self! ... Much appreciation! 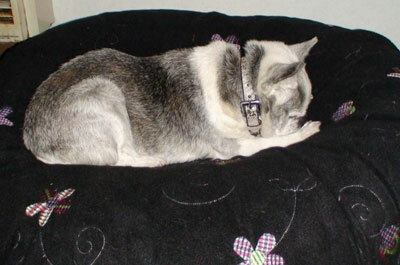 "We have tried many different beds for Angel (right) in the past and she hasn't liked any. She LOVES this air bed! It looks great and has held up to Angel's scratching habit too. Now if she can just get the cat to sleep somewhere else. LOL"
"Love it! My dog lounges/sleeps in it all the time. Super fast shipping also!" "I Think it is a great concept..."
"Oliver loves his (gRRR) bone ~ fast shipping and high quality product ~ THANKS!!"